Vores lejlighed ligger lige midt i Paris. Du kunne ikke bede om mere centralt end dette. Lejligheden har en rummelig opholdsstue med ikoniske parisisk bjælker i loftet med spiseplads og komfortable sofaer, hvor du kan se fladskærms-tv med over 500 kanaler fra hele verden, herunder CNN, BBC, etc. Vi har WIFI og ubegrænset opkald til over 100 lande, så du kan holde kontakten med familie og venner. Du vil sætte pris på den ro og komfort, når du har brugt dagen med at nyde Paris. Beliggende kun få skridt væk fra lejligheden, finder du Louvre, Chatelet, Hotel de Ville, BHV stormagasin, Notre Dame, Ile Saint Louis, etc. Når du træder ud af lejligheden, du er, men en 30 andet gåtur til Louvre-museet og sin ikoniske pyramide indgangen - være den første i rækken uden den tidlige start! Du har også Palais Royal lige rundt om hjørnet, eller Tuileries Gardens lige op gaden, hvor du kan læne sig tilbage og slappe af på en solskinsdag og folk se forbipasserende. Er ingen spørgsmål Spisning herude; der er et væld af køkkener og stilarter, der passer dine smagsløg. Denne lejlighed er beliggende på 1. sal i en sikker bolig højhus i Paris uden elevator. Denne hyggelige lejlighed ville være perfekt til en familie, som det tilbyder alle de bekvemmeligheder i et hjem væk fra hjemmet. Ved indsejlingen er der et indgangsparti, der fører til en hall, hvorfra du kan få adgang til alle værelser i lejligheden. Lige ud på gangen har du soveværelse med masser af skabsplads og opbevaring til dit brug. Derefter ned hallen er stuen, som derefter fører til det andet soveværelse. Sove roligt om natten, men stadig kun få skridt fra spænding og stress og jag i det centrale Paris. I stuen har dejlige gulv til loft franske vinduer, der åbnes på gaden og Eglise Satin-Germain-l'Auxerrois vender. Det rummelige badeværelse har et badekar og separat stall bruser, samt en håndvask, toilet og hårtørrer. Køkkenet er fuldt udstyret med en 2 brænder kogeplade, køleskab, brødrister, kaffemaskine, osv Fuld sæt af sølvtøj og retter leveres sammen med gryder og pander til at hjælpe dig kokken nogle af de lækre franske produkter til rådighed i nærheden. Der er også en vaskemaskine til fri afbenyttelse. Lejligheden er over 60 kvadratmeter. This apartment is located right next to the Louver museum. This location is great to explore Paris. Check in/check out were smooth. Apartment is not big but is mostly very functional (kitchen, closet space, etc) and was great for what we needed. One suggestion to the owhers is to fix a shower head so it doesn’t slide down. Everything else was great. We admit to booking this very last minute, only a week before arriving in Jan 2019 with my family of two adults and two teenagers and the apartment was cosy and warm. We were personally greeted and showed around but everything was self explanatory. Unfortunately they were renovating the church next door so it ruined our view somewhat and workers in the morning meant that sleeping in was not an option. Not that you go to Paris to sleep. My only comment would be the couches, cushions, pillows and the mattresses were all a bit tired. The pillows and cushions were flat and the mattresses had lost all support. It is such a minor thing but I feel an easy thing to fix as in every other way the apartment was perfect. The kitchen was well stocked. They was a washing machine in the apartment. It was great. Overall we had a lovely stay and thank you for the owners prompt response to any questions we had to ask. We rented this apartment for 4 nights for new year's eve. We were 4 with 2 kids (13-11 years old). 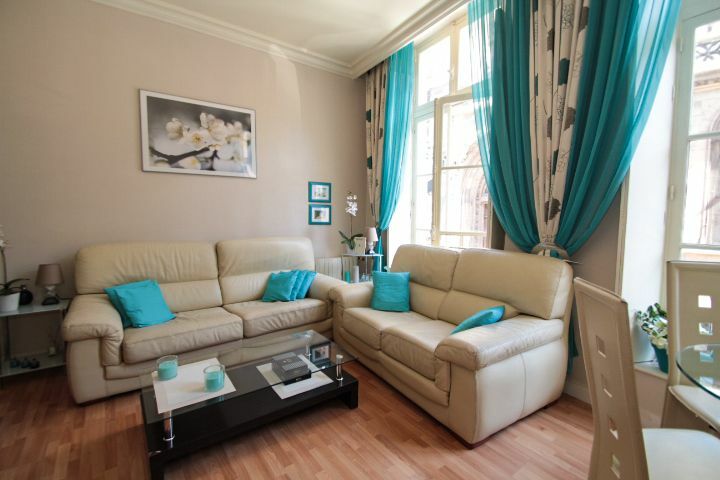 This apartment is located behind the Louvre in a very quite location with no traffic. close to the metro and within walking distance from Notre-Dame and the Latin Quarters, Orsay Museum, Montorgueil, Pantheon, Palais Royal and gardens and Les Halles. In the neighbors there are a lot of Organic minimarkets, bars restaurants with fairly competitive pricing considering you are in Paris. This apartment is small for the American standards probably 500-600 sqrft (the one bedroom with the queen is really small and the bed barely fits); it is good for a family of 4 not more. It has everything needed for the typical tourist that mainly eats at restaurants and it is fairly clean. The apartment is at the first floor above a small restaurant that has very good reviews, but it was closed when we staid, so we can not say how loud would it be. Conclusions, if you want to have a place to sleep, take your showers, have breakfast and go visit the city this is perfect...which pretty much is what we did. Best part is really the location. It is a small, clean apartment. We were a family of 4 with 2 teenagers. Not luxury by any means, but since we were out all day long, it was a perfect place because of its location near metro, shops, the Louvre, and a nice area. We preferred this over a nicer place without such a great location. This Is a great location, within walking distance of all the sights you want to check off your list. It’s quiet at night. It’s well stocked for making breakfast and simple cooking (no stove). and it’s got an unusually large bathroom for the European rental. This biggest drawback is the two twin beds whose mattresses need either replacement or additional layers. They are not comfortable. And it’s an easy fix. Be sure to ask as you inquire. Maybe a little pressure can bring this apartment to it’s full potential. Very functional apartment with 2 good sized bedrooms and a living/ dining room, kitchen and large bathroom. Very close to Louvre and the Les Hales subway/RER station. Walkable to most Paris sites. Quiet at night but there is a lot of construction in the neighbourhood but they dont seem tomstart work until 8am or so. I would recommend for 4 people easily. Lots of space. Only 1 flight to climb. Recommend the Gregorian chant mass at the church across the street on Sunday at 7 pm. Beautiful old church, originally affiliated with the palace ( now the Louvre). A damage deposit of $1,000 will be required on arrival. This will be handled via Visa/MasterCard. You may also pay for your rental by direct deposit or bank transfer to a Bank of America account. Information will be provided on this as needed. Please visit our other VRBO-listed properties: 422828, 357542, 172590, as well as those shown in the link for ‘All My Rental Listings’, below, just under the map.